YC: I remember at the beginning of your essay The Confessions of a Reactionary, you mentioned that the three PhDs were given an award on CCTV. In other words, you were recognized as young and excellent members of society. When did you and Xu Zhiyong become troublemakers in the eyes of the government? TB: There wasn’t a clear-cut moment or event, but rather, a buildup of a series of events. For example, the government was very displeased with our protest against the shutdown of the Yi-ta-hu-tu BBS. This was 2004. Between 2005-2006, as I told you earlier, we were involved in a long series of cases pitting ourselves against the authorities of one level after another across China. I myself provided defenses in several Falungong persecution cases; I was among the first of a group of people to sign Charter 08; I attended the seminar marking the 20th anniversary of the Tiananmen Massacre. No doubt the government became more and more exasperated. YC：How did the government express its displeasure? TB: First the university administration talked to us, respectively, at the government’s behest. The talks were serviceably polite at first. Then, they warned us. After that, the political police, known as the security police, came. The warnings were ineffective so things escalated: I was suspended from teaching, denied promotion, put under house arrest, prevented from leaving the country….then kidnapping and imprisonment. YC: You said that Xu Zhiyong desired to be a mediator between the government and the people. How did he react after being repressed? YC: The authorities strangled the teaching careers of you and Xu Zhiyong. You both paid the price of your career development. Your friend Yu Jiang, I looked up by the way, is the Dean of the Law School at Huazhong University of Science and Technology. TB: Yes. It was a huge blow to me when I was suspended from teaching in 2009 for the first time. I tried many different ways to get reinstated, including writing to the university president. For me, to lose the podium was an enormous loss. For Xu Zhiyong though, Gongmeng was everything he cared about. YC：Someone pointed out to me the fact that Xu Zhiyong didn’t sign Charter 08, implying that his political opposition is not thorough. Are there any special reasons why he didn’t sign Charter 08? Not that I think signing Charter 08 is a test for one’s political position. YC：What led to Xu Zhiyong’s arrest in 2009? Of course, I know it was ostensibly “tax evasion” charges. But in reality, was it just the last straw? TB: It was essentially. But people had different speculations about the direct fuse of it in that situation. Some said it was Gongmeng’s investigation of the March 14 (2008) unrest in Lhasa, Tibet. Others believed it was touched off by our involvement in the Jade Lake wetlands case (翠湖湿地案). It was a case about land rights and had to do with some high ranking Beijing municipal officials. YC: Could you please briefly explain the tax evasion charges? TB: The detailed defense statement is online. A company as small as Gongmeng usually farms out accounting work to an outside accounting firm. Neither Xu Zhiyong nor I knew much about accounting. There might be some minor irregularities in terms of accounting management, but they definitely did not constitute tax evasion, which the government charged Gongmeng with. Gongmeng outlawed by Beijing Municipality Civil Affairs Bureau in July, 2009. YC: In 2009 as Xu Zhiyong was detained and released a month later, the government also shut down Gongmeng. So there was no more Gongmeng six years into its existence.How have Xu Zhiyong’s ideas and activities changed since 2009? I remember you said somewhere that his expressions have become clearer since then. TB: Part of it is my analysis and part of is what he told me. From his public activities and expressions, it was a turning point. Gongmeng had been constantly harassed. Every time we rented a new office, the government would pressure the landlord to force us out. The routine work was affected until its final shutdown. So we began to do more advocacy work, for example, “Citizens’ Pledge.” Wang Gongquan was the most avid promoter of it. YC：This is in 2010. When did Wang Gongquan start to get involved in the activities of Gongmeng? TB: He had been supporting Gongmeng long ago. Laterhe joined our board, attending our weekly meetings and helping in decision making. He is a gentle-mannered and humble person with insightful views and efficient management skills. He began to publicly support us. 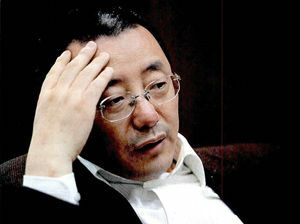 Wang Gongquan was pivotal in getting Xu Zhiyong out of jail in 2009. Gongmeng was fined 1.42 million RMB. Gongmeng received a lot of donations from the public, but more than half of it came from Wang Gongquan. During the so-called Jasmine Revolution in 2011, I and many others were arrested, but Xu wasn’t. People like me, Tang Jitian, Tang Jingling and Liu Shihui who got arrested had had a lot of street actions and were participants and organizers of many protestsand “on-site watch and protest” (围观), such as showing up outside black jails, during the “three netizens” trial in Fujian, the protest against a garbage incinerator in Panyu, Guangdong, the Ni Yulan trial, and the Chen Guangcheng trial, etc. YC: Xu Zhiyong wasn’t so much a street activist. Is that also because he wanted to protect Gongmeng? TB: He was the most important organizer in rescuing petitioners from black jails. But before 2011, he rarely went to the street, mainly because he felt he needed to protect Gongmeng. After 2011, however, you could see he changed, for example, things like writing an open letter to Xi Jinping. He would never have done that sort of thing before. He didn’t want himself to become sensitized, otherwise it would destroy Gongmeng. That Gongmeng couldn’t carry out its routine work accounted of course for this shift of his. Buta more important cause was the rise of the overall level of social movements in China. The New Citizens Movement was born out of this background. Xu Zhiyong was actively involved in the free Chen Guangcheng movement, the Anni incident in Hefei, and the campaign for asset disclosure by officials. 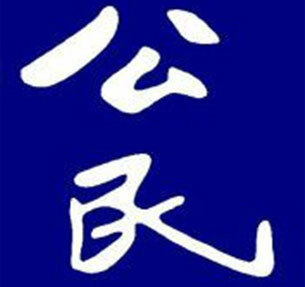 YC：Xu Zhiyong published The New Citizens Movement in late May, 2012. Looking back, that’s the manifesto, if you will, that he issued and that marked a new chapter of Gongmeng’s endeavor, even though Gongmeng as an organization ceased to exist. But Xu Zhiyong, you and others had been promoting the concept of “citizen” before 2012. You yourself had written articles about it, including Citizens’ Virtues and Citizens’ Responsibilities in the Post-totalitarian Era (in Chinese) which you wrote in as early as 2008. So when did you guys first start to promote the social movement from the angle of citizens’ responsibilities and citizens’ rights? YC: But people still call it Gongmeng anyway. YC: Between May 2012 and the spring and summer of 2013 when the government arrested scores of participants, the New Citizens Movement had not had the time to do more activities. In relation to the charges against them, people have been talking a lot about the assets disclosure campaign and the equal access to education campaign. Unfurling banners on the street to demand that officials disclose their assets is more straightforward. I would like you to talk a little bit about the campaign for equal access to education. TB: Xu Zhiyong and Gongmeng had long ago started to take up the issue of equal access to education. First, we focused on schools for migrant workers’ children, then on the study of residence permits. Later we advocated for the abolishment of the policy that bars migrant workers’ children from taking the college entrance exam at locations other than where their household registration is held.The “equal access to education” campaign aimed at minimizing the inequality between urban and rural areas in terms of education resources distribution. The “equal access to education” campaign includes the following activities: ensuring the normal operation of schools for migrant workers’ children in the cities; abolishing the household registration requirement so that these children can take high school and college entrance exams where they are living now. 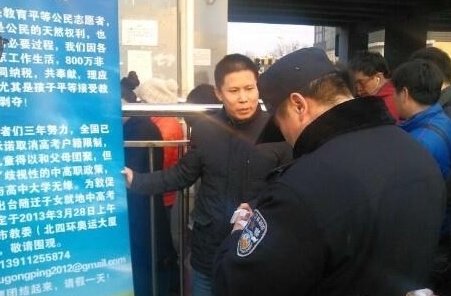 Xu Zhiyong outside a subway entrance/exit in February, 2013, calling parents to petition outside the Beijing municipal education commission. He was being questioned by a police officer. Initially, only four parent volunteers signed up to participate in the campaign to abolish the household registration requirement for exams, but two years later, over 100,000 signatures were collected. The Department of Education was pressured to promulgate a new policy in August, 2012, that allowed migrant workers’ children to take the college exam at the location where they live. Since then, the policy has been implemented in all provinces except for Beijing and Shanghai. After Dr. Xu was arrested, Beijing and Shanghai also issued new policies to make good on the issue. YC: So the campaign benefited millions and millions of Chinese families and children by pressuring the Chinese government to modify its inhumane, unequal and unreasonable policies. Think about it, it’s extraordinary and a model for a social movement in China. Recently I heard from an activist who worked on the campaign with Dr. Xu thatXu zhiyong had a complete proposal with regard to public school resource distribution and the freedom to choose private schools. Now, when the New Citizens Movement began, you were already living in Shenzhen. How did you two communicate and coordinate your activities? TB: Yes. We often communicated online. Later I was allowed to resumeteaching, so I had to go to Beijing every month. We had plenty of opportunities to meet, and I participated in most of the important events. YC: Let’s now talk about the Qian Yunhui incident in 2010-2011. The citizen investigation team led by Xu Zhiyong concluded that it was a regular traffic accident in the midst of the public’s outcry that believed Qian Yunhui, the village head of Yueqing (乐清), was murdered by the colluding developer and the government. Xu Zhiyong was widely criticized, and one of his most vocal critics was none other than Ai Weiwei. Tell us more about it. TB: I was in Beijing at the time. Xiaoshu (笑蜀), Yu Jianrong (于建嵘) and others also went to Yueqing. Gongmeng’s board discussed the matter and decided to conduct a citizen investigation. So they went. There was a lot of information online, and public opinion was tense and raw. Then one day when some of us were dining together, we saw that Xu Zhiyong published his findings on Twitter. We were all shocked because he did not discuss them with us at all. The findings were immediately and overwhelmingly criticized. When he came back to Beijing, he explained to us. He firmly believed that his conclusion was right, though he acknowledged some minor shortfalls. I rejected his findings completely. Later when he planned to publish a second edition of his report, I told him it depended on how it was written. Xu Zhiyong, Yujian and I, as well as the board,we discussed it for many rounds. YC: So, Yu Jiang was still on the board? Wang Gongquan (王功权). He has been freed but is under such surveillance that he is totally inaccessible. TB: Yes, he still was then. The conclusion didn’t change in the second edition. And I firmly objected to it. However, Xu Zhiyong did a lot of persuasion, and convinced the majority of the board, so the second edition was published. At the time I said this incident would hurt the standing of Gongmeng and Xu Zhiyong himself, and it would take a lot of hard work and a long time to regain it. YC: Does he still believe his conclusion was right? TB: He doesn’t think his conclusion had any problems. He said, this was indeed a traffic accident; you cannotdeny the facts just because you oppose the government, something like that.Later I wrote an article titled The Schizophrenic Truth (in Chinese). My view was that, as an ordinary individual living in China, you have no power to access the body, the forensic reports and the witnesses, etc. When you have no authority to access anything, you don’t have the power to approach the truth. I am not saying your conclusion is wrong; I am saying that you don’t have the “authority” to find the truth. Therefore, you can’t reach a conclusion. The only thing you can do is to observe and question the procedure of the government’s handling of the case. YC: He has to have some bases. What are they? TB: The report has it and is available online. I believe he had acquired some information that he thought was very convincing. But I think the way he thought about this incident was problematic. I mentioned earlier about him being a mediator between the government and the people in a clash of the two sides. He hoped to be inthat middle role. Namely, he does not automatically side with the people for the sake of political correctness. If the government is right, we should give it credit. But of course, this government has perpetrated so much evil that almost everything Xu Zhiyong has done has been struggling against rights violations and fighting for civil liberties. But on the Qian Yunhui matter, this is what he genuinely thinks: None of you people has gone to Yueqing. You decided it must be a murder because of your pre-established stance. First, you could have wronged the government; and more importantly, you could have wronged an innocent person. On the latter point though, we probably should accord Xu Zhiyong some sympathetic understanding. 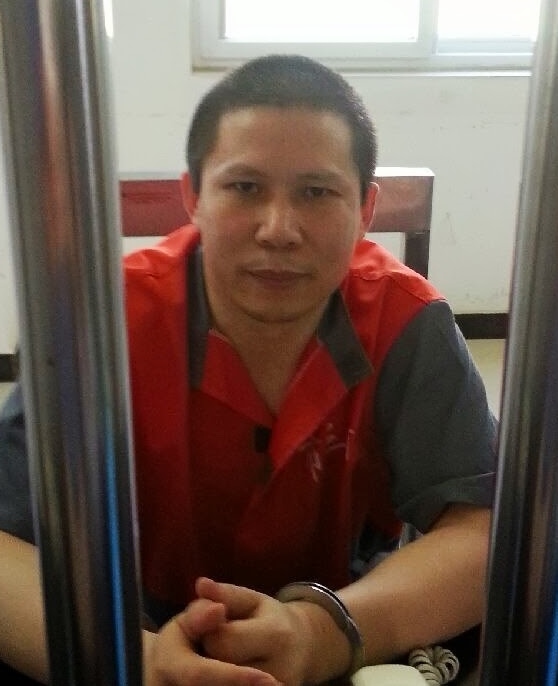 Xu Zhiyong in Beijing Third Detention Center in July, 2013. YC: After Xu’s trial in January, his wife wrote an open letter to him in which she said, “I don’t blame you at all for today’s result and I accept it calmly. But it is not because what you persist in doing is noble to me. It’s because fate has pushed you the point where you must chose to persist and give up on everything else.” What are your thoughts on this? TB: Several things are at play here: the push of events, people’s expectations, and the larger political landscape in China. But above all, it is his own commitment. He has always assumed a very important role in the rights defense movement. In 2005 when Asia Weekly(《亚洲周刊》) selected 14 rights defense lawyers as the “People of the Year in Asia,” Xu Zhiyong was featured first and given the longest introduction. Furthermore, he has always been very clear about his role. He has clear political aspirations and a rare willingness to make sacrifices. He is driven by an unusual sense of calling. YC: When I first got involved in activism and was still finding my way, someone told me, in clearly a pejorative sense, that Xu Zhiyong harbored political ambitions. My reaction then was that having political ambitions isn’t necessary a bad thing. China needs people with political ambitions. Having known Xu Zhiyong better now, I think it would be great if China has three hundred Xu Zhiyongs who are ambitious, visionary, committed and, on a daily basis, willing to roll up their sleeves to do things. TB: I totally agree with you. First of all, having political ambitions and aspirations is a citizen’s right. There is nothing wrong about that. Secondly, many people think politics is dirty, corrupt and cunning, and therefore involvement in politics makes you dishonest. This is not so. The political reality in China isn’t pretty, but politics itself should be beautiful. I think Xu’s political ideals have a lot of influence from Havel. Xu Zhiyong wrote an essay titled Beautiful Politics. He believes that the reason we want to get into politics is because we want to transform dirty politics into good politics, tyrannical politics into free and open politics. YC: Xu Zhiyong has always been very positive and high-minded in his expressions. A lot of people dismiss that and make fun of it, sometimes malignantly. Indeed we live in a time of cynicism, and Xu Zhiyong’s heroism seems out of place. Today he is in jail, and as I get to know him better, I do think he is a hero. TB: He is. His passion and perseverance in promoting democracy and rule of law in China are rarely seen. China has plenty of idealists, myself included, but his purity and idealism are rare. Courage, restraint, self-sacrifice, enduring passion – he has these qualities. Then of course he also has some other qualities. For example, he has a doctorate in law, he is a university instructor, a former people’s congress representative, and a renowned public intellectual, not to mention all the lives he has touched, directly or indirectly, through the work of Gongmeng. YC: The New Citizens Movement has taken such a hard hit. Xu Zhiyong was sentenced to four years in jail, and Ding Jiaxi (丁家喜), Zhao Changqing (赵常青) and the rest are awaiting trial [they have since been tried, and are now awaiting a verdict]. Going forward, what can we expect? TB: In 2003 when we three PhDs wrote an open letter to the National People’s Congress, it was published in the state-owned mainstream media, but in 2014, this has become unthinkable. Many key activists are in prison, and sweeping restrictions have been placed on civil society, ethnic minorities, the internet, education, religion, and ideology. The Party beast has once again raised its terrible head. But over these ten years, society has undergone great changes, and the resistance by human rights lawyers, rights activists, citizen reporters, public intellectuals, NGOs, and new media has never ceased. The people have never stopped putting on a fight, the space for such a struggle has grown despite continuous suppression, and social movements are beginning to take on scale and mature. The call for human rights and freedom among the Chinese people cannot be eliminated. We should be grateful for those pioneers who smash open the iron gate with their flesh, and their sacrifices and suffering are priceless. We must follow the path they have blazed for us. YC: Dr. Teng Biao, thank you so very much. I benefited a lot from today’s conversation, and so will our readers, I think. So let me thank you on their behalf as well. Finally, off the top of your head, can you tell an anecdote of Xu Zhiyong? TB: Let me think. During the “2003 Ten People of the Year in Rule of Law,” the TV station came and shot short videos of us in advance. In the Xu Zhiyong video – I hope you can still find it somewhere — there is one scene where Xu Zhiyong and petitioners were chatting. One petitioner gave him an apple and he took it, wiped the apple on his pants and then ate it. This is something I could not do. I would have most definitely washed the apple clean first before eating it. But knowing Xu Zhiyong, this is very natural of him, not a “performance” and it shows his character. In his interactions with petitioners, he has never been an outside observer, nor condescending. He is connected to those at the bottom of society and their plight. 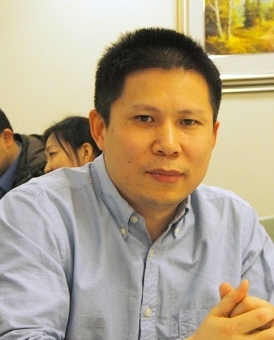 YC: Dr. Xu Zhiyong was arrested in July, 2013, and on January 22, 2014, he was sentenced to four years in prison in the trial of first instance for “gathering a crowd to disrupt order in a public place.” Many Chinese were outraged, legal scholarsrefuted every aspect of the case, and the international media reported the trial widely. You and Xu Zhiyong pursued doctorate degrees in law together at Peking University with the same advisor, and you were two of the three PhDs to write to the National People’s Congress demanding a constitutional review of the custody and repatriation system in 2003. You founded Gongmeng (Citizen League, or Open Constitution Initiative) together and, two years ago, initiated the New Citizens Movement with your other friends. The two of you have gone through many trials and tribulations over the last decade, and I cannot think of anyone in this world better suited to discuss Xu Zhiyong with. So let’s get started. First of all, tell me a little more about your time at law school together. TB: Xu Zhiyong and I studied for our PhDs in law between 1999 and 2002. We were Professor Zhu Suli’s (朱苏力) first two doctoral students. We hung out a lot during those years, the two of us and also Yu Jiang (俞江). We used to frequent little eateries outside Peking University’s west gate where we discussed a lot of issues, often getting into heated debates. YC: What did you discuss? Or rather, after all these years, what sticks out in your memories? TB: Our conversations were very broad — religion, philosophy, history, politics, economics,and of course law, from the loftiest topics of human nature down to specific legal cases. What we discussed most though was constitutionalism, democracy, and China’s political transformation, as well as social ills such like reeducation through labor, chengguan (urban management enforcement), custody and repatriation, and the petitioning system. YC: I learned from a recent English news report that Xu Zhiyong was often in contact with petitioners when he was still in graduate school. This left a deep impression on me. TB: Right. In 2001 he went to Tieling, Liaoning (辽宁铁岭) to provide legal assistance to villagers and was detained briefly by the local government. He was nearly disciplined by Peking University for that. He also described another incident to me that occurred when he was still an undergraduate. He was on summer vacation in his hometown in Henan province when there was a clash between local authorities and villagers. He inserted himself and played a mediator, literally standing between the two hostile sides. In the end, he was able to diffuse the tension. My understanding is that this incident shaped him quite bit. He has hoped to be that mediator between the government and the people, to the greatest extent possible using peaceful and legal means to resolve conflict. Also, there was the Qiu Qingfeng incident in 2000. Xu Zhiyong became a natural activist and organizer of the campus protest. I was with him on the Jingyuan Lawn (静园草坪) where the sit-in protests were held. Our classmate Yu Jiang passed a note to us reminding us to be mindful of our safety. That was the start of our friendship. From left, Teng Biao, Yu Jiang, and Xu Zhiyong.YC：So Gongmeng was founded after the three of you had left Peking University? 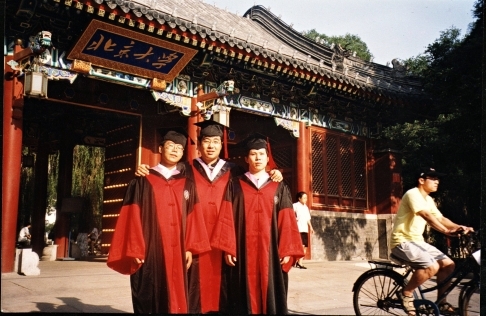 YC：So Gongmeng was founded after the three of you had left Peking University? TB: Yes, at the time we all had our teaching jobs: Xu Zhiyong taught at the Beijing University of Post and Telecommunications, I taught at the University of Politics and Law in Beijing, and Yu Jiang taught at Huazhong University of Science and Technology. YC: Following the Sun Zhigang incident, I’m sure you went through a lot of deliberation, and then you decided to found Gongmeng. How exactly did you make that decision? TB: The Sun Zhigang incident had had a big impact on us. We were widely reported on by mainstream media in China as well as the international press. There are grievances and injustices perpetrated all over China. As our names were publicized in the papers and other media, many victims of injustice started to write or call, trying to contact us. For Xu Zhiyong, the idea was: if the three PhDs could abolish the Custody and Repatriation System, they must have extraordinary capacities. They found hope in us by bringing their cases to us to seek resolution. At that point we felt we had to establish an organization, one with staff and an office to carry out routine work. So we established this organization in October, 2003. It was not called Gongmeng at first, but Sunshine Constitutionalism (阳光宪政), short for the registered name “Sunshine Constitutionalism Social Science Research Center”(阳光宪政社会科学研究中心). YC：So the initial objective was to provide legal aid to petitioners and victims of injustice? TB: More than that. Look at the name “Sunshine Constitutionalism.” Sunshine represents openness, plus constitutionalism. The political aspiration was right there from the beginning. YC：Freedom, openness, and constitutionalism……these were also issues you three debated a lot while in graduate school, weren’t they? TB: We did. We were both deeply influenced by thinkers such as Friedrich Hayek. Our liberal ideas developed very quickly, and so did our criticisms of the communist system. Therefore, Sunshine Constitutionalism was never just about helping petitioners. Soon after Sunshine Constitutionalism was founded, Xu Zhiyong ran for the Haidian District People’s Congress. At the same time, in July that year, we held a series of election forums called “We Are the People’s Representative” in Beijing. The forums trained independent candidates, analyzed China’s system of People’s Congress, discussed reforms that could be made, and invited some district and municipal People’s Representatives to talk about their experiences. Quite a number of independent candidates were successfully elected. In Haidian District alone [Beijing’s northwestern district with a concentration of universities], 18 independent candidates were elected. TB: 2004. In 2004, we were also involved in the “Yi-ta-hu-tu BBS” incident, where a highly influential Peking University BBS domain was shut down. You can see that, from the start Sunshine Constitutionalism’s activities involved democratic elections and freedom of speech. YC: You and Xu Zhiyong are very close. What writings and authors do you think had the greatest influence on you two back then? Please cite a few names. TB: The ones that had a big influence on him and those that influenced me might not be the same. But I think Western liberal thinkers like Friedrich Hayek, Isaiah Berlin, Benjamin Constant, the novelist George Orwell, and also Vaclav Havel greatly influenced both of us. We read Hayek, Havel, and Tocqueville together. For Xu Zhiyong, the rural educator James Yen (晏阳初) in the pre-communist Republic of China era probably had an important influence on him. He is certainly a follower of Mahatma Gandhi and Martin Luther King, Jr., and he firmly believes in non-violent struggle and moral power. YC: What about Nelson Mandela? Someone said to me the other day that Xu Zhiyong’s closing statement to the court reminded him of Mandela’s trial defense. I said, if I had to guess, Xu Zhiyong very likely had read Mandela’s self-defense. TB: Well, Xu Zhiyong’s statement is actually highly consistent with his own style. But he definitely admires and appreciates anyone along the lines of Gandhi and Mandela. YC: In 2004, Xu Zhiyong wrote an essay called Going Back to China (《回到中国去》, in Chinese), in which he accounted his life as a visiting scholar at Yale University. As far as I know, you also went to Yale as a visiting scholar. Did you two go together? Can you talk a little bit about it? What did you gain from this experience? TB: He went earlier than I did. I went in 2007. We were both visiting scholars at the China Center of Yale Law School. I remember he was at Yale when the Yi-ta-hu-tu BBS was shut down and Gongmeng was holding seminars on People’s Representative elections. While in the US, he volunteered in the presidential campaigns that year, going door to door canvassing, if I remember correctly. YC: Following the Xu Zhiyong trial in January, Malcome Moore of The Telegraph interviewed four people who Xu Zhiyong had helped. One of them was a petitioner from Shenyang living with her family in a underground tunnel in Beijing when Xu Zhiyong ran into them. He then brought food and clothes to them, and he even – I was very surprised by this detail — lived in the tunnel for three days to feel what it was like. Among other things, she related how Xu Zhiyong was always carrying a black notebook with information about petitioners and their photos. So please tell me more about his contact and work with petitioners. TB: I don’t know all about it, though it was something he talked about a lot when we were together. We had had extensive discussions about the petitioning system: the tragic experiences of the petitioners and how the problem should be solved on the system level. He went to petitioner villages a lot. Not just petitioner villages, but also the government offices set up to receive the petitioners and hear their grievances: Letter and Call Bureau, Letter and Call Offices, the Letter and Call Office of the National People’s Congress, the Letter and Call Office of the State Council, the Letter and Call Office of the Supreme Court, etc. YC: What did he want to accomplish by frequenting these places? Xu Zhiyong (许志永) staying with petitioners. YC: This reminded me of an indignant tweet of his, probably in 2012. He said he had accompanied someone to the People’s Supreme Court, and there in the waiting hall he was slapped in the face by a guard. So what drives him to do this? I feel he must be really driven. TB: He is. My understanding is that his continued push for the rule of law and human rights in China over the last ten years or so has to do with his strong and pure political ideals. YC: We mentioned that, from the very beginning, Gongmeng was not just a consulting center for unjust cases. We also talked about Gongmeng’s work in promoting independent candidacy in People’s Representative elections and freedom of speech. Can you tell me more about Gongmeng’s work over the years? TB: When Xu Zhiyong was detained in 2009, Yang Ziyun (杨子云) and I put together an article titled What Gongmeng Has Done over the Last Six Years (in Chinese) which gives a relatively detailed account of Gongmeng’s activities from 2003 to 2009. Last year Xu Zhiyong himself also wrote The Last Ten Years. Gongmeng’s involvement included the Sun Dawu case in which a private business man was charged for raising funds from private citizens; investigation of forced abolition in Linyi, Shandong province with the blind lawyer Chen Guangcheng that eventually resulted in Chen being sentenced to four years in prison; the Cai Zhuohua case in which a Beijing minister was arrested and sentenced for printing Bibles without a permit; the wrongful death sentences in Chengde; the report on the petitioning system; and the campaign for direct election of leaders of the Beijing Bar Association. Other high profile cases include the tainted milk scandal andthe black kiln indicent¹. In both cases, Gongmeng provided legal assistance to the victims in their search for justice and compensation. 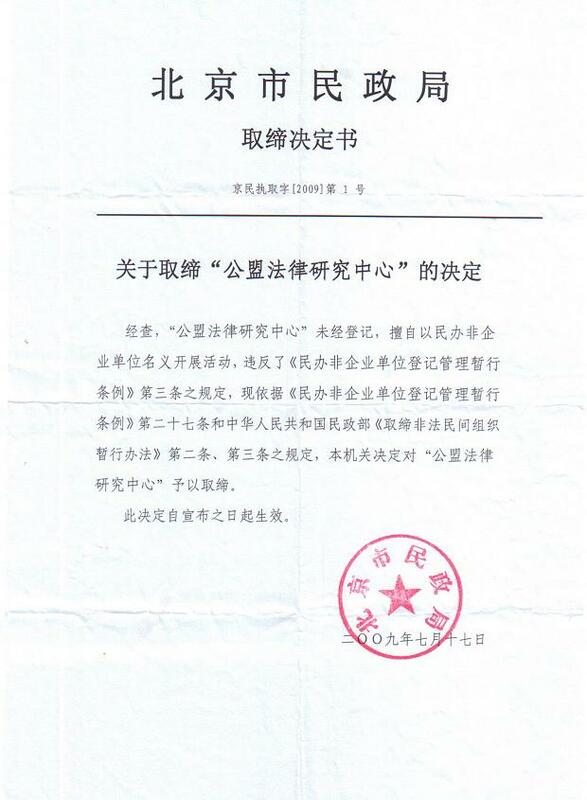 Xu Zhiyong was also the defense for Yu Huafeng (喻华峰) and Cheng Yizhong (程益中), two editors of the Southern Metropolis tried on trumped-up charges in a government retaliation for their exposure of the Sun Zhigang incident. Gongmeng was also involved in the oil field case in northern Shaaxi province and rescuing the lawyer Zhu Jiuhu, who had been detained by the police along with his clients. I remember Li Heping (李和平), Gao Zhisheng (高智晟), Xu Zhiyong and I, the four of us, went to Jingbian detention center (陕西靖边看守所) and we took photos upon leaving. After walking a hundred yards or so, a dozen or so armed police stopped us, pretty scary. But we had no fear and kept talking and laughing. We greeted them with the same ebullience. And we even took photos of the scene. That was 2005. In Shaaxi. From left: Gao Zhisheng, Li Heping, and Teng Biao. Xu Zhiyong was taking the photo. YC: I think I have seen this photo somewhere. TB: In 2005, Gongmeng issued the Report on Human Rights Development in China. The United States publishes an annual human rights report that is all criticism. China publishes an annual human rights report that is all self-accolades and covering up problems. Xu Zhiyong said, “we are going to issue a human rights report from the point of view of the civil society. If they have made progresses, we will give them credit; and where they have problems, we criticize them. We will not stop at criticism; we will make policy proposals.” This is the way Xu Zhiyong has always been: we do not oppose for the sake of opposing. He strives to be “rational and constructive.” At the time he didn’t use the word “oppose.” “Political opposition” is a phrase that has been used only since the last couple of years. As university faculty at the time, the government had yet to treat us as troublemakers. And he has worked very hard for years on getting the four wrongfully convicted death row inmates in Chengde absolved. YC: What has become of the Chengde case? TB: It is still in limbo. Those four inmates have been imprisoned for 17 or 18 years by now. Xu Zhiyong has gone to Chengde many times, and Lin Zheng（林峥）has been there several times. Several other lawyers and I all went at one point or another. Another area of his effort is the schooling of the children of migrant workers. He did field studies and he struggled for the education rights of these children. YC: This was before the equal education rights movement? TB: This was in 2006, or even earlier. 2006 was when the project was launched to conduct research on the conditions of schools for migrant workers’ children in Beijing and the legal protection of them in order to make legislative proposals that will protect the education rights of migrant children. 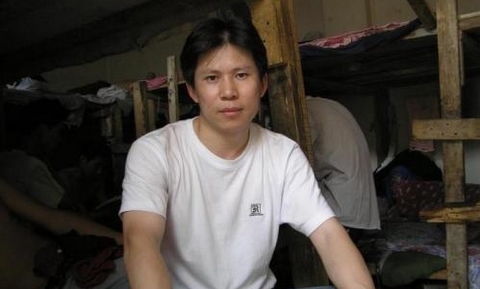 YC: Eight years later, Dr. Xu is in prison for fighting for equal education rights for these children. Ironically, the government has actually adopted many of the proposals he has made that have benefited millions of families, but they fear his grassroots work and social mobilization and feel compelled to lock him up. That’s a reality that cannot be emphasized enough. TB: That’s really the core of the matter. But do keep in mind that most of our policy proposals have been ignored and rejected. The government doesn’t want participation from the civil society; they are afraid of it. In 2009, Gongmeng organized and campaigned to directly elect the leaders of Beijing Bar Association. We attempted to democratize it. YC: What was the outcome? TB: It failed. The Beijing Bar Association, supposedly a professional organization, was completely under the Communist Party’s control. It not only failed to democratize, many lawyers who pushed for direct elections were retaliated against afterwards. Some didn’t pass their annual review, others got their licenses revoked. The authorities made all sorts of reprisals against them. Another area of Gongmeng’s work was to push for information disclosure. Lawyer Yang Huiwen (杨慧文), who at the time worked in the Gongmeng office, did a lot of work in this regard. He wrote to 73 government departments and offices requesting information disclosure on a variety of issues. YC: How did it go? Was he able to receive what he had requested? TB: There was a news report (in Chinese) somewhere. He got a bunch of receipts and two responses. At one point he was told that he had no business to ask about such information. YC: Given that petitioning is still a big problem and there seem to be more and more petitioners in Beijing seeking justice, can you tell us a little more about Gongmeng’s report on the petitioning system? What kind of report was it? Who was it for, and what did it say? TB: Gongmeng formed a project group to draft a report on the petition issue in China. The group conducted extensive field studies in three counties in different parts of China as well as petitioner villages in Beijing. It produced an in-depth report of nearly 200,000 words. Upon the completion of the project, Gongmeng invited well-known scholars in the area as well as government officials across China to attend a large-scale seminar on the petitioning system. The report was widely circulated at the time, resulting in the public paying more attention to this special group of people known as petitioners as well as the reality of China’s so-called Letter and Call system. During his research and field studies, Dr. Xu Zhiyong published many accounts of petitioners being beaten and tortured, and he called the attention of authorities to the issue of mistreatment and demanded that the rights of petitioners be respected. YC: Did it work? Well, I can answer this question myself: we have Jiujingzhuang (久敬庄)，Majialou (马家楼) in Beijing. We have black jails all over China. And until recently, we had Masanjia (马三家), the horror of horrors. About the petition report, did Gongmeng submit it to somewhere? What was the government’s feedback, if any? TB: I don’t think we submitted to the government. But the government definitely knew about it and made no response. YC: So we can say that Gongmeng had, to a great extent,investigated many aspects and issues of Chinese society. Is this a more or less objective assessment? TB: I think so. Gongmeng over the years has been involved in the rule of law, human rights, forced demolition, urban management enforcement, the household registration system, food safety, and many high-profile cases of injustice. In some situations we conducted studies and held discussions with experts and professors, in others we took direct action to intervene and to make a difference. YC: My understanding is that, at first, there were only a few of you, and then it developed quite a bit. Can you tell us more about that? TB: Gongmeng had to change offices several times due to government harassment. At its peak, there were three or four full-time employees. Others, Xu Zhiyong, Li Fangping (李方平), Li Xiongbing (黎雄兵), Wang Gongquan (王功权), Guo Yushan (郭玉闪), myself, and other lawyers, all of us were volunteers who held weekly meetings at the office to discuss matters. There were also internet volunteers who posted blog posts, issued information, or did other things. I don’t have a number at my fingertips. YC: Today, rights lawyers play a crucial role in pushing for change in China and, to me, they represent a bright spot. Gongmeng was the starting point of the rights lawyer community, wasn’t it? TB: Well, I wouldn’t put it that way. Gongmeng and the rise of rights lawyers are definitely connected, but I wouldn’t say Gongmeng was the origin of the rights lawyer community. Before 2005, apart from the six or seven lawyers working with Gongmeng, other rights lawyers were scattered and isolated. 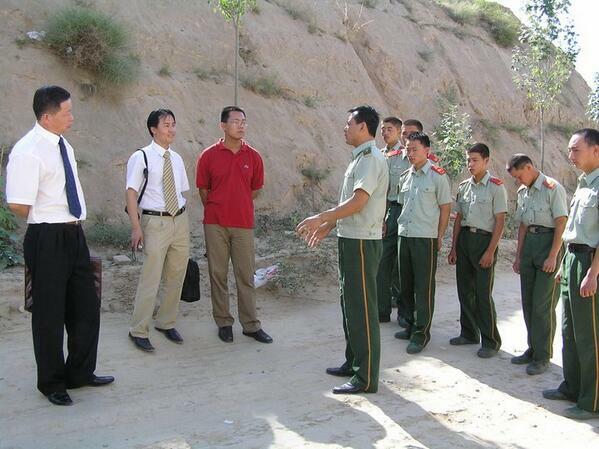 In ‘05, six lawyers participated in the Cai Zhuohua Bible printing case. With both the Dongyang Huashui case (东阳画水案, a case in 2005 involving mass protest against environmental degradation in Zhejiang) and the Shuangyashan house church case (双鸭山教案), quite a few lawyers got involved at the same time. At the end of 2004, Gao Zhisheng (高智晟) stood up and stepped out, writing open letters to the Chinese leadership calling on the government to stop its persecution of Falun Gong practitioners.We met in 2005, and starting that time, rights lawyers began to seek each other out, make ties, and stick together, and the community has since grown like a snowball. Again this was in 2005. Gongmeng was part of it, but not the origin of it. In the short history of NGOs in China, Gongmeng was pretty much the one in the forefront. There are other NGOs that have been pretty good, such as Love, Knowledge and Action（爱知行）, Beijing Yirenping Center (益仁平), Tianxiagong (天下公, Justice for All), Transition Institute (传知行)、Shenzhen Equity & Justice Initiative (衡平), The Unirule Institute of Economics (天则研究所) and others. They either focus on a particular area or on research. AIDS was very sensitive before, but it doesn’t concern the political system. In terms of the rule of law, human rights, democracy and social movement, Gonegmeng has been in the very forefront. In addition, 64Tianwang, run by Huang Qi and others, Liu Feiyue’s Civil Rights and Livelihood Watch and Zhang Jianping’s Human Rights Campaign in China are all very good platforms for human rights information and activities. YC：I am familiar with the last three, but if you ask me, they are very different from Gongmeng. There is some overlapping, but Gongmeng, obviously, is a more comprehensive, visionary organization with much bigger aspirations. TB: Indeed. Gongmeng works with many lawyers, scholars, professors, and journalists, especially legal journalists. Some are influential personalities inside the system. They hold meetings about specific topics or engage directly in actions. Among Chinese NGOs, Gongmeng is a rarity that has clear political aspirations, pays close attention to rule of law and human rights, actively engages in social movements, and has gained the support of a large number of intellectuals working inside the system. A rarity indeed. China’s growing human rights movement can claim many accomplishments, (originally titled “From Gongmeng to the New Citizens Movement) by Teng Biao, Washington Post, April 18, 2014. Citizen (公民), formerly known as Gong Meng or Open Constitution Initiative, and founded by some of China’s preeminent rights lawyers, is a NGO based in Beijing that provides legal assistance to the disempowered and promotes the New Cititzens’ Movement. Read the original here. On March 31, 2013, Yuan Dong, Zhang Baocheng, Ma Xinli, Hou Xin and two others unfurled banners in downtown Xidan plaza, Beijing, calling for officials to publicly disclose their personal assets. Ten or so minutes later, they were taken away by police, and later, four of them were criminally detained on charges of “illegal assembly.” According to Article Two of the Law of the People of the People’s Republic of China on Assemblies, Processions and Demonstrations, “assembly” refers to “an activity in which people meet at a public place in the open air to express views or aspirations.” Assembly differs from average expressions in that assembly must be a collective expression through a gathering of a certain number of people. For example, Hong Kong’s Public Order Ordinance stipulates that collective expression of views by more than 50 people require a notice of intention. On that day, only four people were there holding the banners while Yuan Dong gave a speech. The others on the scene were onlookers, not participants of an organized event. The five were simply expressing their personal views by exercising their right to free expression and right to “criticize and make suggestions regarding any state organ or functionary” conferred by Article 35 and Article 41, respectively, of the Constitution. Their action does not constitute an assembly in legal term, and there were no such things to speak of as “disobeying an order of dismissal” and “seriously undermining the social order,” elements of the offense of illegal assembly as defined by Article 296 of the Criminal Law. Fighting corruption is every government’s responsibility. Mr. Xi Jinping has also vowed to “shut power in the cage of regulation.” Although Chinese government has been talking about fighting corruption every year, and has indeed punished many corrupt officials, corruption is becoming more rampant than ever. Everyone recognizes that corruption is a malignant cancer of contemporary China. The root of the problem is the absence of a system capable of checking it. Public disclosure of officials’ personal assets is an effective anti-corruption mechanism, and 137 countries and areas around the world have established or implemented asset disclosure policies. Out of their sense of responsibility as citizens, the ten advocates stood up to call for asset disclosure by officials. In March they held a discussion to draft a proposal for related laws, hoping to promote the establishment of a mechanism in an incremental way. Unfortunately, instead of adopting their suggestions, the government put them in jail. On the one hand, this is persecution of the healthy elements that work to build a civil society, and on the other it discredits the anti-corruption promises made by China’s top leaders. We first appeal to the Chinese authorities: Please mend this mistake by respecting the rule of law in this case, recognize the innocence of the ten men and return their freedom through proper legal procedures, and provide necessary compensation to them. Mr. Xi Jinping once pledged to “carry out judiciary justice in each and every individual case,” and we hold him to his word. We will watch every detail in the development of this case concerning the ten men arrested for advocating asset disclosure by officials to see if that pledge was made in good faith. We will then decide whether we can pay any respect at all to the relevant authorities. We thereby urge the relevant authorities: The trial of the ten citizens must be independent, public, fair, and meeting all the requirements of judiciary justice. We also appeal to the public: Please pay close attention to the ten citizens’ case. Rights exist for all or for none. Violating one citizen’s rights violates every citizen’s rights; those whose rights are trampled are not far away from us, and their fate is closely related to our own fate. Finally, we must appeal to both Chinese and foreign media: Please fulfill your obligation as reporters, zoom in on the case of the ten citizens, ask questions about every detail and every procedure, and report the truth without trepidation. We solemnly promise: We stand together with Yuan Dong, Ding Jiaxi, Zhao Changqing and rest of the ten citizens to continue to push for asset disclosure by officials. At the same time, we will hold ourselves to our aspiration of being a real citizen, and we will begin to change our country and society by changing ourselves for the better. We will not give up no matter what difficulties await. To the regular readers of this blog, Dr. Xu Zhiyong (许志永) is no stranger. He’s one of the founders of Gong Meng (公盟), or Open Constitution Initiative, a Beijing-based NGO dedicated to providing legal assistance to the disempowered and to developing civil society. As hundreds of others, Dr. Xu has recently been placed under house arrest because he is deemed a threat to stability and therefore must be locked up to ensure serene meetings of both the NPC and CPPCC, now in session in Beijing. During his confinement last week, he wrote a long letter, his second one, to Xi Jinping (original here, the first was written during the 18th Party’s congress last November). With his approval, this is a partial translation of the recent letter. It’s interesting to note that Dr. Xu was a two-term people’s representative, in 2003 and 2006, in Haidian District, Beijing. In 2011, he again campaigned for the District people’s representative in the constituency of Beijing University of Posts and Telecommunications where he teaches, but was met with deliberate obstruction on the part of the university administration. He lost to no other than Fang Binxing (方滨兴), the father of the hated Great Fire Wall of China and the president of the university. The Chinese Constitution states that the NPC is the ultimate authority in legislation, election, supervision, and decision-making on important matters of the country, having more power than any parliament in the world, but in reality, NPC is nothing more than a rubber stamp, and its annual convention more like a press event for the emperor’s new clothes, a grand show full of artifice, disgrace and evil. This year, a young woman of the post-’90s generation has become a representative because she had helped someone courageously, but she has no idea why she has become a representative. A woman told the media that she represented the “foot washing girls.” Do they know who they are and why are they there? The most absurd aspect of “people’s representatives” in China is the idea of representatives having to represent a certain class. According to the system of representation, no matter what your profession is, once you are elected to be a representative, you assume the duty of a member of the country’s legislative body according to the law. This is a representative’s most important duty, so much so that it becomes their only professional identity. A representative’s basic job is to draft laws, elect the head of the nation and national officials, and decide the nation’s budget, and his or her job has no connection to their original identity as a worker or a farmer. But this plain and simple truth has been distorted by the propaganda machine. It makes it look like only workers may represent workers, and only farmers may represent farmers; that, instead of enacting laws and welding the power to vote, the representatives are meeting just to give the leaders “advice.” Look, it says, we have workers, farmers, ethnic minorities, intellectuals, 90’s generation, even foot-washing girl, how broad the representation is and how splendid our socialist democracy truly is! Housed in heavily guarded hotel rooms according to strict hierarchy of each representative’s worth, ordinary representatives are no more than “extras” on a movie set who have no independence whatsoever to speak of. On the other hand, during China’s district/county level of elections of representatives, the state has employed almost every form of the state power to clamp down on independent candidates, including tearing the candidates’ posters, summoning them, investigating their tax records, intimidating voters, sabotaging meetings, refusing to accept lawsuits against government wrongdoings, illegally restricting candidates’ freedom of movement, and more. The Congress conducts “elections” and voting without the least competition, for there is only one candidate for each position, and that candidate is likely to have been decided beforehand, if not several years before. On top of that, the representatives know nothing about the candidates, nor do they care whether the candidates are competent or corrupt. After all, some of China’s most corrupt officials, such as Cheng Kejie (成克杰), Wang Huaizhong (王怀忠), Wang Baosen (王宝森) and Liu Zhijun (刘志军), have all been elected in such a manner through each level of People’s Congress. And on each level, the process is controlled strictly by the Communist Party. The representatives don’t bother to ask questions about how the country’s trillions are spent, the gapping deficit in China’s social security fund, the monstrous spending on stability maintenance that surpasses the military spending. No, they have no questions. Each resolution is passed in near-perfect vote of yea, and the rubber stamp is thus stamped. Inside the system, this is called “walk the procedures.” The representatives don’t care. Their positions don’t come from the people; for them, being a representative is an honor bestowed on them by the power holders, and it is a cherished ticket to the club of the privileged. For being so artificial, the NPC cannot help but being ugly. Everyone is canny with his or her own calculations, fathoming carefully the intention of a superior, speaking only the “right” things, making only the “appropriate” proposals. Shen Jilan, who has never voted a no is able to hold onto her representative status for over sixty years, while Yao Xiurong (姚秀荣),who began to speak up for the disempowered in her second term, has since disappeared. They show one face when they are sitting at the podium and another when they are not. What they speak is never what they think. They discuss trivial matters, falling asleep listening to reports. In the evenings they swirl around dinner parties to forge connections. The few young and fresh faces in their midst look more like decoration than anything else. In front of the media, they would sometimes talk about the livelihood of the people; and their proposals are forgotten as soon as they are made. When they speak during the sessions, they do so in the order of their official rankings and seniority, in the style of partyspeak. They are unanimously “inspired” when they review the government’s work report; they ingratiate their superiors but also take the opportunity to promote themselves. They pledge loyalty before the voting; during panel discussions they condemn in unison petitioners, a nuisance for their officialdom. Ordinary citizens don’t care who represent them. Not that it matters if they do. Year after year, the citizens of this country make the annual NPC and CPPCC their pastime by picking the most flabbergasting proposals and speeches, laughing at the yawning and slobbering representatives, gossiping the movie stars’ luxurious homes, the fallen corrupt officials, and the mistresses of the superrich. It gets more ridiculous every year. Hidden behind such falsity and shamefulness is the inevitable evil. Some lies go away, such as that of the Great Leap Forward, but other lies have been paraded for more than six decades. Among them are lies that the system of people’s congress is China’s “fundamental political system,” and that the NPC is “the supreme body of state power.” Moreover, the system is billed as the most advanced democracy, and presented every March in a grand ceremony! Behind the extravagant show, however, black jails dot the capital city from Jiujingzhuang camp (久敬庄), run by the state, to certain outlaying, walled-in residences in Changping (昌平), from the backyard of the Youth Guesthouse (青年宾馆) to the basement of Juyuan Guesthouse (聚源宾馆), not to mention the Beijing Offices of all levels of local governments. Thousands of government employees and temporary hires crowd the entrances of the Commission for Discipline Inspection of the Central Committee of the CCP, the Supreme Court, and the State Bureau for Letters and Calls [to intercept petitioners], while petitioners, in the number of tens and thousands, are subjected to harassment, illegal stalking, illegal detention, and brutal physical abuses. In November 6, 2012, Petitioner Zhang Yaowen (张耀文) from Henan province was taken away from Jiujingzhuang relief center by force, and was beaten to death in a car with tinted windows because he refused to surrender his cell phone. Since his death, his sister Zhang Yaohua has not been able to file a case in any court. I hope there will be no more sacrifice of innocent Chinese citizens to the show in 2013! The grandiose National People’s Congress has nothing to do with the people. The most deep-rooted belief of China’s political system is still “power grows from the barrel of the gun,” and the operation of the regime is built on this terror-based ideology: Politics is barbaric; whoever wins the power struggle will rule; the harder your fist the more say you have; politics is for self-enrichment; the red regime cannot change color, and stability is above everything else; politics is cruel, a life-and-death game in which one must have no qualms in pursuing one’s objectives. In short, China’s foundation is not the people, not humanity, not conscience, but guns, the law of jungle, and the duo of violence and lie. Over the decades, citizens of China have grown indifferent to whoever become the representatives, to the “rubber stamp” itself, to the trillions in taxpayers’ money, to the lavish show itself. Never do they think the country is theirs. But in a country where even monks are fitted with administrative grade levels, how can anyone truly stay away from politics? When a country is built on an artificial, shameful and evil foundation, how can we expect to have a sound society? Every March, the state propaganda apparatus hangs out the “Learn from Lei Feng” flag in an attempt to rebuild “socialist morality.” CCTV’s “Touch the Heart of China” evening gala was all about smuggling goods for the party: the honorary president of the Red Cross recommended legislation to punish private charities; “the most beautiful born-after-1990”girl was bewildered that she had become a people’s representative; “the most beautiful female teacher” propped herself up from her sickbed to pledge life-long commitment to communist ideals, so on and so forth. On the other hand, the last thirty years have seen a slow awakening of civil awareness with citizens taking initiatives to claim their civil rights and responsibilities, but the dirty hands of the government have been everywhere to obstruct them and sabotage them. I understand there isn’t a society that’s perfect. I don’t expect every official to be a role model and a clean civil servant, but they at least cannot be such a hypocritical, greedy, cruel and despicable group as they are today. I don’t expect everyone to be an angel, but at least they should not be distrustful, hostile and mutually harmful as they are now. It might be too much to ask for perfect fairness and justice, but China must not be a place shrouded in the smog of injustice as it is today. This country must change its foundation and bring to an end the authoritarianism. China shall be reinvented on the principle of liberty, justice and love. Around noon on May 4th, 2012, Song Ze (宋泽) received a phone call in which the caller said someone who had been put in a “black jail” [an illegal prison used mostly to detain petitioners, disempowered citizens who went to Beijing to file a complaint about his/her local government] hoped for help, and asked Song Ze to meet him in the lobby of Beijing South Railway Station at 2 o’clock. Same as ever, Song Ze did not hesitate to respond. What had Song Ze done? Song Ze’s original name is Song Guangqiang (宋光强), born in 1985 in a mountain village in Xiangyang (襄阳), Hubei Province. He graduated from Zhongnan University of Economics and Law in 2010, majoring in international politics, and also minoring in finance. He received a dual-degree in law and economics. After graduating from college he worked at a foreign-capital enterprise, but he could not give up the ideals in his heart. In October 2011, he wrote a long letter to me, relating his own experience and dreams growing up, hoping to join the team of the Open Constitution Initiative (公盟). The first impression Song Ze gives people is that he is reticent and shy, but deep down he is a passionate idealist. He does not care how much money he makes, how hard he has to work; all he cares about is how his own actions would affect society. As it turned out, the Petitioners’ Rescue Program was lacking in manpower, and so Song Ze’s responsibility was to contact the volunteer rescuers, to purchase new, or pick up donated, clothes and blankets, to distribute clothing and give sick people emergency aid. All winter long, Song Ze more or less had no Sundays and no holidays, keeping busy with volunteers at Beijing South Railway Station’s nearby ghetto, in the underground tunnel and other places where poor petitioners gathered. For many cold, cruel windy nights, he checked the bridge tunnels one by one to make sure new petitioners had cotton-padded blankets. In China, even if it is just pure aid for the needy, humanitarian efforts face huge pressure because of the special identity of rescuees on the one hand and the social ideals of the rescuers on the other. On the night of the Lantern Festival (lunar January 15th), volunteers who were distributing rice dumplings to petitioners were blocked forcibly by police. Volunteer Yuan Wenhua was taken away, so was Song Ze when he asked the policemen to show their IDs. The rest of us waited outside the police station until they were released. Black prisons are places where local governments illegally detain petitioners. If the petitioners try to go to the Prime Minister’s house or foreign embassies near Dongjiaominxiang (东交民巷), Wangfujing Street (王府井大街) or other places where they are not supposed to petition, they could be taken away by police. During the so-called sensitive time of Two Meetings each year, they could be apprehended just passing through Chang’an Street (长安街) and being found carrying petitioning materials. All these are labeled “irregular petitioning” and the petitioners who have been rounded up are sent to Jiu Jing Zhuang (久敬庄), the detention and deportation center run by the State Bureau of Letters and Calls. Jiu Jing Zhuang would order local governments’ Beijing offices to take away petitioners from their jurisdictions on the same day they arrive in Jiu Jing Zhuang. However, most petitioners cannot be dispatched back to their homes that same day. They must wait to be sent home, perhaps needing a few days or a few weeks, and this turns into a profiteering opportunity for some people. People running the black prisons are those who have connections with officials in the State Bureau of Letters and Calls or local governments’ Beijing offices. They rent hotel basements, hire thugs, forcibly take the petitioners from Jiu Jing Zhuang, illegally detain them, and then order the local governments to come to get the petitioners and pay a fee for the latters’ stay. They fetch 80 to 200 RMB per petitioner per day. Each year the black prison atrocities reach their height during the Two Meetings (National People’s Congress and National Committee of the Chinese People’s Political Consultative Conference). On the eve of the Two Meetings this year, Song Ze verified 49 black prison locations and sent out a map of Beijing’s black prisons. On March 5, 80-year-old petitioner Hu Yufu (胡玉甫) was put in a black prison. On the 7th he fell ill, begging to get treatment. To this, the secretary of the Committee of Politics and Law said, “Petitioners cannot be indulged! If he is sick, let him figure out what to do.” Hu was finally sent to the emergency room on the 12th, and died on the morning of 13th. Song Ze helped his son sue the Party secretary, mayor and other officials of Xinxiang municipality (in Henan province) for illegally detaining his father. Starting from September of 2008, our organization’s volunteers visited and watched black prisons, exposing this crime to the public, and rescuing the petitioners. Over the last few years, conditions in black prisons have had improved, and police have taken more action to investigate them upon receiving reports. But black prisons still exist in large numbers. To visit black prisons and to try to rescue prisoners there exemplifies a citizen’s willingness and courage to right a wrong, but in this upside-down country, Song Ze was thrown in jail for this very reason. Why was Song Ze detained? On January 11 of this year, Zhao Zhenjia (赵振甲) , Song Ze and others received an urgent text message from Hunan petitioner Yu Hong seeking help. They braved the severe cold of Beijing searching for four hours, and finally found the exact position of Chenzhou’s (of Hunan province) black prison. Afterwards they got in contact with over ten reporters and volunteers, and together they went on a rescue mission. On the morning of January 13, Zhao Zhenjia, Peng Zhonglin, Guan Weishuang, Song Ze, and others, ten people in total, came to the black prison. While videotaping the process, they broke into the room and rescued three elderly people who had sought help. They were 73-year-old Yu Hong, 57-year-old Chen Bixiang and 82-year-old Long Jiangbao. One of them had been detained for over 40 days already. The living conditions there were awful with no heat, and each person had only a thin blanket. They were not given enough food either, often just one pack of ramen noodles per person per day. There were only a few guards on duty then, and before they realized what was going on, the petitioners had already been rescued. But soon the police came. Instead of punishing the real criminals, they tried to take away these courageous citizen volunteers. While arguing with the police, they managed to take the three petitioners onto a bus, even though some guards followed them onto the bus. That day, when I hurried over to the scene, the rescuers had already gotten onto the bus and left. I told Song Ze (over the phone) that I would be waiting for them near OCI’s office on the East Third Ring Road. They got off the bus, with four guards from the black prison in tow. I stopped a taxi, Song Ze and three petitioners got in promptly, and I blocked the door to fend off the guards. The taxi made a loop and took Song Ze and the three petitioners to the office of OCI. He bought meal for them, and send them to the nearby long-distance bus station with enough money for them to go home. This rescue mission became the very reason for Song Ze’s arrest, the charge being “provoking disturbance” and the reason for the charge being “disrupting the public order.” Before Song Ze, 60-year-old Zhao Zhenjia (赵振甲) had already been given a year and a half of reform-through-labor, a form of imprisonment, for his participation in the same event. Of course, Song Ze could have been retaliated against for another reason. Several days before his arrest in early May, he did something that irked the authorities: he took a cab to Shandong, picked up the wife of Chen Kegui (nephew of the blind lawyer Chen Guangcheng), took her to Beijing and hid her. I regret to have sent him to do this—he risked too much. But I had never imagined Song Ze would end up in prison. Song Ze’s case was one directly handled by Beijing Public Security Bureau. Lawyer Liang Xiaojun (梁小军) made several trips to the detention center before finally being granted a meeting with Song Ze. Apart from the rescue on January 13, he was interrogated about how he met me and what he had done at OCI. When the 37 days that he was sentenced were up, Song Ze was not freed. It is now such a preposterous case that the charges against Song Ze are too ridiculous to show to the world. The prosecution has not issued approval for an arrest, but the PSB does not want to let him go. Now they have placed him in residing under surveillance (监视居住). In reality, residing under surveillance is more formidable than imprisonment. According to the new Criminal Procedure Law, the authority may designate the location for residing under surveillance, but it shall notify their relatives. But China being China, Song Ze’s family has not received any notification. He can still meet with his lawyer when detained in the detention center, but it’s been more than 40 days since he was put under residential surveillance, no one has been able to see Song Ze; and the PSB has refused to answer any questions on his whereabouts. In our time, Song Ze is hard-to-find idealist. As he wrote in his letter to me, “I tried to force myself to just live my own life, but I discovered that this is quite difficult to do. If I see someone on the roadside in need of help but give no hand, I would be pained afterward. If I see something unfair around me but do nothing about it, I feel ashamed. When I see others who are able to give lot of help to the needy, I would blame myself for being useless, wishing I could do more……” We are all very concerned about Song Ze, and worry about what he is being putting through.